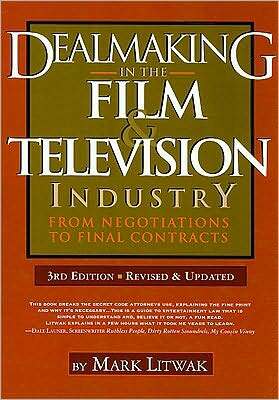 Dealmaking in the Film and Television Industry — the popular, award-winning "self-defense" book for everyone working in the film and television industry — is now updated to include the latest legal rulings and entertainment technology developments. Addressing a general, non-attorney readership, it is a fascinating, highly accessible guide to current entertainment law's peculiarities, "creative" practices, and practical applications. Armed with Dealmaking in the Film and Television Industry, filmmakers can save themselves thousands of dollars in legal fees as they navigate the shark-infested waters of the entertainment business. Whether you're a producer, writer, director, or actor, Mark Litwak will help you make the most of your business dealings while steering you clear of the many contractual traps that may await you. "The best overall guide to dealmaking I've seen. Solid information from a knowledgeable source." — Gary Salt, Agent, President of Paul Kohner, Inc.
Mark Litwak is a veteran entertainment attorney with offices in Beverly Hills, California. His practice includes work in the areas of copyright, trademark, contract, multimedia law, intellectual property, and book publishing. Litwak also functions as a Producer's Representative, assisting filmmakers in the financing, marketing and distribution of their films.